Vera Wang Love Struck Perfume - This is the latest perfume addition to my collection and I've worn everyday since I got it. It was a hard choice between this one, the original, and the floral rush version. I went for this one but I might have to buy the other as well! The notes are pink guava, angelica flower, mandarin, Indian jasmine sambac, tuberose buds, blue lotus blosso, sheer musk, precious woods and vanilla. I also love the bottle design! Anthropologie Angel Food Candle - I'm not a huge fan of candles despite loving how they make my room smell because 9 out of 10 candles irritate my skin and eczema. I decided to take a risk and add this candle to my basket when I was making an Anthroplogie order and I'm glad I did. So far, fingers crossed, this candle has been fine with my skin and the scent is heavenly. It smells like a mix between sweets and cakes. 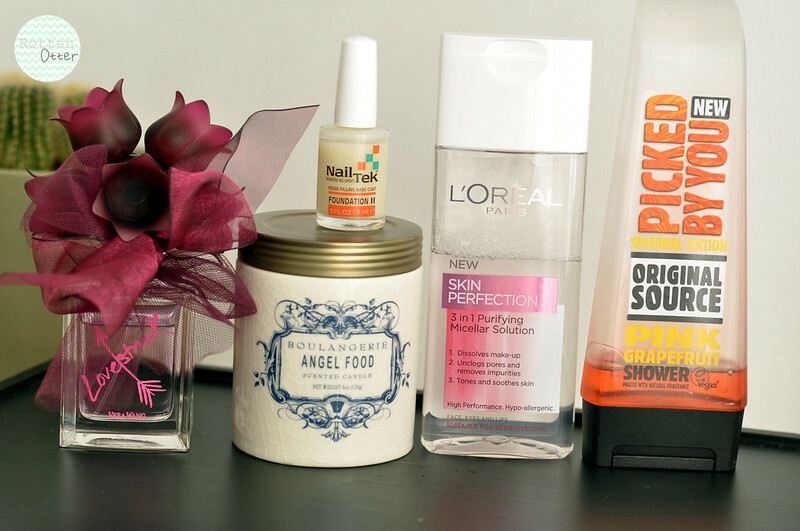 I also love the packaging and how it looks on my bedside table. Nail Tek Foundation II Base Coat - I've raved about this base coat so many times on the blog already but I just had to include it in this months favourites anyway. It's by far my favourite top coat and the only one I've been using this month. It dries almost instantly and with a matte finish which makes applying the coloured polish even easier. It has quite a thin consistently so despite me using it nearly every time I paint my nails, I've hardly made a dent in it so it's going to last a long time. It's about £12 so is expensive but definitely worth it. L'Oreal Micellar Solution - This is the first "drugstore" micellar water I've tried and it's the closest match I've tried to Bioderma. It hasn't got a scent and it feels exactly the same on the skin as well as removing every last trace of make-up. As it's cheaper I'm sure the ingredients aren't as good as Bioderma's but if you're on a budget then this is perfect. I'll definitely be buying more bottles of this inbetween Bioderma. Original Source Pink Grapefruit Shower Gel - I've raved about the NSPA grapefruit shower gels before but this is even better. You can clearly see how much I've been loving it! This is a limited edition scent for the summer so I'll have to stock up a couple of bottles like I did last year with the pineapple scent. NailTek is my holy grail! Oooh I'm such a fan of Anthropologie; their mix of products is just wonderful! I only wish they had micellar waters more easily available in the US, they're a bit hard to come by!